Let’s Make Candy Clay Hearts! Let’s Make Candy Clay Hearts for Valentine’s Day and Other Recipes From Our Past! 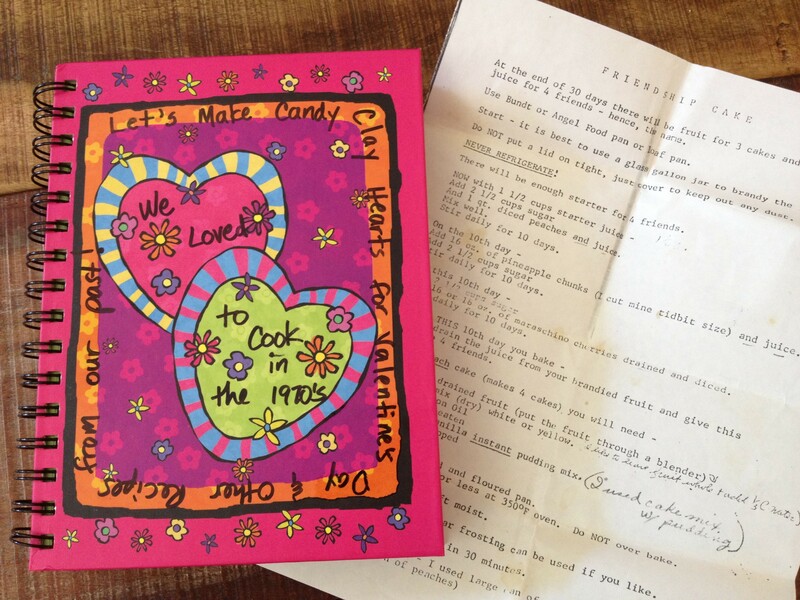 We Loved to Cook in the 1970s (December 2012) is a wonderful book you’ve never heard of. You’ve never heard of it because it is unpublished, existing only in a single, handwritten, spiral-bound copy in Sacramento, California. The book belongs to my mother, and was written a few months ago by her friend of nearly 40 years, Mollie Gilbert. Through stream-of-consciousness storytelling that makes the reader both tear up and laugh aloud, with accompanying recipes – many photocopies of the index-card originals – it chronicles the women’s time as elementary school teachers in the late sixties and seventies in Northern California. And it’s really special. Mollie was inspired to write the book – probably over one weekend, I imagine – by my blog project. When I learned this, and read the book for the first time, I couldn’t believe it. This sort of sharing and documenting of the past, through food, was exactly what I was after. To see the project multiplying, shimmering outward like the watery rings of a skipped rock, was exciting. And because Mollie was so good at it, I asked her if I could share a bit about her “book” here. On the title, candy clay was a project the women undertook in 1974 after a University of California, Davis (UCD) extension class called “The Unheard Child.” I’m confident this is likely the exact title of the class because Mollie seems to have an impeccable memory for these things, along with an appreciation for colorful detail, as you’ll see in the below excerpts. Blend the above ingredients and then mix one pound of powdered sugar. Knead until smooth. Add more powdered sugar, if necessary, to make a non-sticky pliable clay. Divide and add paste food coloring for intense bright colors. GOOD LUCK! This recipe is followed by one for “Green Goo,” which I can’t help but include here because of its ultra-1970s resonance. This was always brought by a fellow teacher of Mollie’s – Marilyn Gillaspy – to potlucks; Mollie notes it is now difficult to find the ingredient Beau Monde. Blend until chopped, then stir into 1 cup mayonnaise and 1 cup sour cream. Mollie writes about how the teachers often brought cakes for each other’s birthdays – a tradition that somehow, sadly, seems unlikely today – and includes recipes for Tunnel of Fudge Cake, Chocolate Chip Chiffon Cake with Coffee Crunch and even one for Pumpkin Pie Cake, with a photocopy of the original recipe, in my mother’s careful, teacherly script, replete with hand-drawn pictures of many of the ingredients as an illustration for the students. When the book begins to feel like a sweet, straightforward record of shared recipes and early teaching experiences – at a time when art and cooking and tactile projects and creativity seemed to occupy a more prized place alongside reading and math in the school day – it takes a turn. With the touching account of a beloved friend who “always had something in her lunch that jiggled,” the notebook suddenly captures much more about the lives of a group of teachers and lifelong friends. 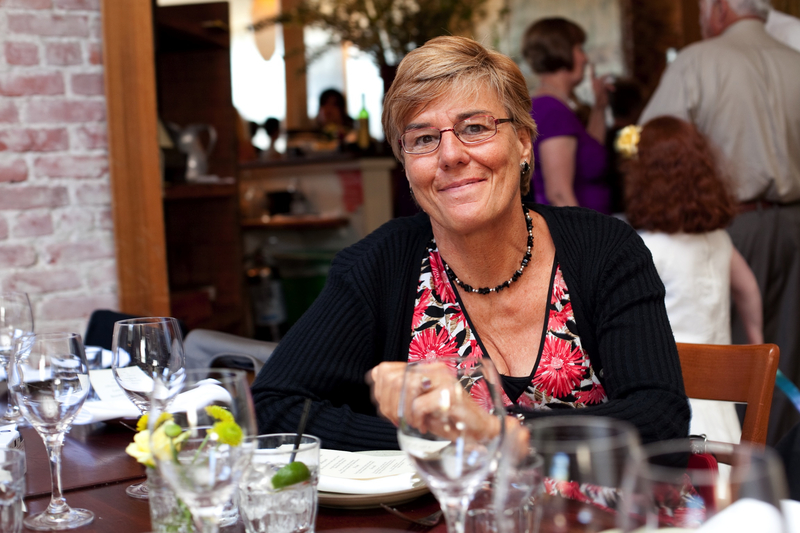 Our wonderful, crazy friend Barbara Corrigan was a great fan of any jelled food item. She always had something in her lunch that jiggled. I made the following “salad” for her birthday cake one year. I used the aforementioned tube pan and even put candles on it. She had to blow the candles out so fast so the cake wouldn’t melt. Apparently it was the first birthday cake anyone had made for her since she was a little girl. Her mother wrote me a thank-you note and we became good friends because of this…. Whenever I see jello, aspic or jelled consume – I think lovingly of Barb. Add in order given. Mix well or until mayonnaise is melted. Pour into mold and let stand. Chill before serving. When Barbara got really sick in 2002, Roberta and I were fortunate to have one last meal with her in September. She had been in various hospitals all summer and finally was able to be home with a caregiver. I called Berta and said I was going to fix a tomato aspic for Barbara. I decided if it turned out OK we would take it over to her and have lunch. We were there with Virgia Currin, the hospice nurse, and Barbara. We were laughing and reminiscing about our lunches in the crowded little teacher’s room at Westmore Oaks. We looked over at my perfectly set aspic and realized it was sitting on the portable commode because the room was so crowded. I’ll never forget that day and the great times we have shared with friends and food. She even mentions the Tupperware mold she used that day – selecting the heart top “rather than the Christmas tree or star,” more appropriate for the occasion. Unwrap cream cheese. Score with a knife in a crosshatch pattern: [sketch included]. Sprinkle with seeds. Pour soy sauce over. Serve with crackers. We always used Wheat Thins. She closes with a recipe for friendship cake, another “food fad that prevailed” at the time. The idea behind the communal cake was similar to that of sourdough bread: the recipe involved a starter, though the cake’s starter was a “juice” of brandied fruit meant to be shared amongst four friends. Mollie’s recipe came from a woman named Erlene Culver, a former principal of Elkhorn Village Elementary School in Northern California. I was trying to remember if Roberta knew her, so I set the recipe aside. Gloria Curtis [another mutual friend] called almost at that moment to tell me she had passed away today. 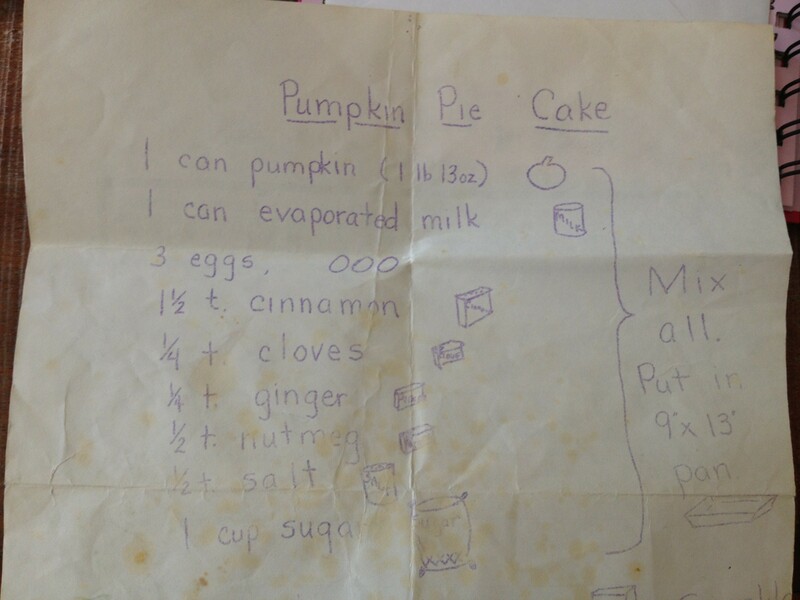 I decided to include her recipe as a tribute to those educators who came before us. With that final recipe for friendship cake, an aged, stained photocopy nestled in its little envelope, she closed the book with a thank-you to my mom “for being such a loyal, kind and loving friend” and an offer to add more recipes to the book if my mom can find them. Mollie’s ability to remember people, places and moments like no one I’ve ever known – and her sharp, sometimes brash but always full of heart way of verbally sharing those stories – has always made her the ideal party guest. But what I didn’t know is how this quality would translate to preserving experiences on the page. The sweetness and candor of the impromptu book is so her, so elegant in its simplicity (I’m sure she’d laugh to read that about herself), and so inspiring in the way it feels like a little time capsule. She was able to capture a particular time in her life – and the lives of her teacher friends – by sitting down one weekend, with a colorful spiral-bound notebook and bright Rollerball pen, and writing. So, to the educators in our lives, to my mother, and to the author herself. You have served to inspire, guide and equip so many children to explore and succeed in the world around them. And you have made a mark in the lives of each other through food and everyday celebrations and poignant moments. For me, these stories, these recipes, will be my starter.